ASU is gearing up for its annual Spring Connection Day, which will feature a variety of exciting and informative activities. 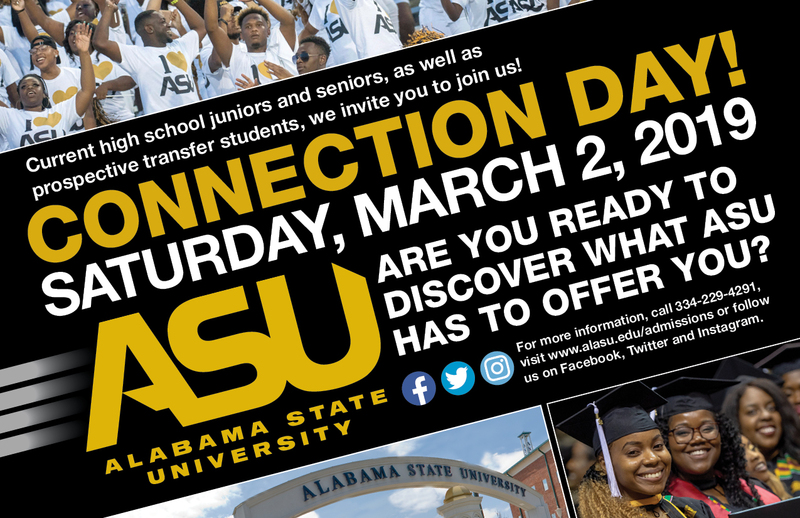 Alabama State University’s Office of Admissions and Recruitment will host its annual Spring Connection Day on Saturday, March 2, from 10 a.m. to 2 p.m. Registration begins at 9 a.m.
Current high school Juniors and Seniors, as well as prospective transfer students, are invited to visit ASU for a first-hand experience of the academic and student support programs available to its prospective students and families. Parents also are encouraged to attend. The first 1500 to register will receive a ticket to the ASU vs Texas Southern University men’s basketball game. Discount tickets will be available for $5. The Lady Hornets tip-off at 3 p.m and the Men tip off at 5 p.m.
For more information or to register online, visit https://secure.qgiv.com/for/alastauni/event/798308/ or contact ASU's Office of Admissions at 1-800-253-5037. The Connection Day itinerary information will be available soon. Registration ends on February 22, 2019.